In all of my recollections, only two family vacations during elementary and high school come to mind. They were a weekend at Camp Marydale in Erlanger and a week’s stay in the Smokey Mountains. As you can see, family vacation time away from home was not a priority for us. I am certain it was not feasible for my grandparents nor their parents and so on, simply because they were farmers and could not leave their responsibilities. My parents were not farmers but were not accustomed to vacations as we know them today. Back to my two vacations. The Camp Marydale mini-vacation was just that. It was a Friday, Saturday and Sunday interrupted by a knothole all-star game that I HAD to play in. I believe it was played at the Camp Springs Ballpark, thus a great opportunity to showcase my skills before a home crowd. I don’t recall if we won, lost or tied but the game was a BIG deal. Lesson to be learned, don’t vacation ten miles or less from home because it really is not a vacation. So the weekend vacation, after we returned late on Saturday evening to Camp Marydale, was about a day and a half in length. Our only real vacation was, as I mentioned earlier, to the Smokey Mountains. Mom, Dad, my brother Vern and I traveled with my Uncle Al and Aunt Betty together with their children Edward and Terrie. I only remember staying in a mountainside cabin with a rushing stream behind it. 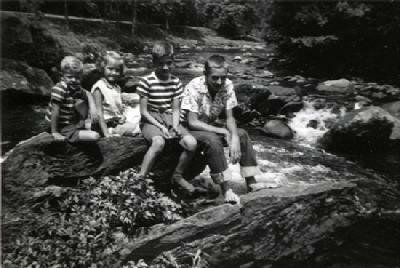 [Pictured (L-R): Mike Enzweiler, Terrie Enzweiler (Schultz), Vern Enzweiler (Mike's brother) and Edward Enzweiler] Pictured (L-R) Mike Enzweiler, Terrie Enzweiler (Schultz), Vern Enzweiler (Mike's brother) and Edward Enzweiler. Really not much as far as family vacations but I did not feel deprived in any way. It is all what you get accustomed to.